Hey guys! 🙂 It’s Li Ying here. If you remember in a previous discussion, we AAM-ers thought it might be fun to write a song for David or perhaps about David. Inspiration for this came when Tracy posted the song It’s Not Goodbye from the Vietnamese Archies. Anyways, I was watching some videos on songwriting and I thought I might share them here. I mean, I’m not sure about you all, since I criticise David a lot about his songwriting, I’d be a hypocrite if I didn’t learn more about it myself. Also, I thought we might like to learn about the craft which is essentially (supposedly) David’s main job description (I hope lah) as a musician. So what goes on behind every song? Each person has their own method. Here’s a couple of vids I found on my favourite songwriting blog allaboutsongwriting.com which is run by an experienced songwriter, Corey Stewart. You can head over there and have a look around. His articles are really helpful. He’s also very happy to answer your questions so if you have any just leave a comment. Here’s another “how to write a song” video. This one’s from Marie Digby. She’s probably a more familiar name to us. This time, her method is by writing the music first as opposed to writing the lyrics first. If I’m not mistaken this is what David usually does as well. His problem is in writing the words to go with it, which is why he hires other writers. I like Marie Digby’s video because she was actually coming up with the song on the spot so we can see how it actually is done instead of having it explained. Take that Taylor Swift! Songwriting can be a great way to pass the time. It is also cathartic and purgatory for some people, well in other words it’s good for you in the way that chicken soup is. Or chocolate. 🙂 Like what Marie said. So why not give it a go? ← Someone Like You, David? Reading your article reminds me of a certain scene in the film which I mentioned in a previous thread, which I’ve encouraged you guys to watch – Dead Poets Society. In many ways, writing music and lyrics is very much like writing poetry. In poetry writing, we savour words and language, and rhythm too. In serious song-writing, of which I have no experience, I guess it’s about savouring words and language put to music. From the film: We don’t write poetry or write good music because it sounds cute. But because we are part of a human race and the human race is filled with passion – it is what we stay alive for. I began to realise all this when I was much younger and loving the film DPS. We write music/poetry because we want to “contribute a verse” to our world. Which brings me to my opinion of the 1st 2 vids you posted. I guess they are very helpful for people who want to write songs that fit into the “Hit” genre. But I disagree with the fact that beauty of music/poetry should be measured by circles and lines. The 3rd vid shows how music of real artistry should be written. Marie Digby seems to go with the flow of her emotions when writing her songs. IMHO that shows true artistry. But it calls for talent and aptitude towards this field, which I think, liying, you have. 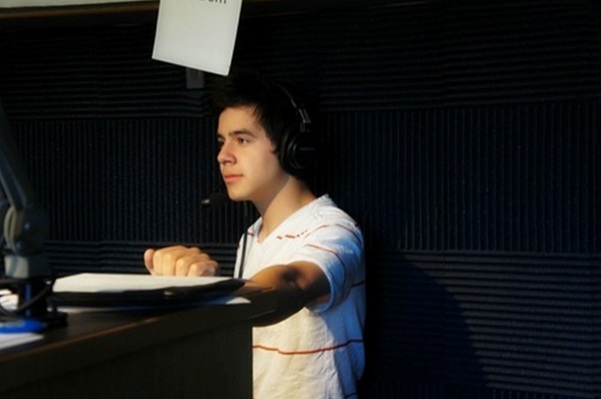 I totally believe David is made up of a brain that is music-filled. He has so much music and musically-driven emotions to give. It’s a shame that his flow of words is not comparable to his flow of music. Bravo on your first post! Thanks for all the videos about songwriting especially the last one of Marie Digby. LOL at one part of her song I thought it sounded very much like a Taylor Swift song! Not an expert on this topic or poetry writing for that matter but I’ve often watch interviews where famous artistes were asked where they get their inspirations to write their songs. Guess there’s no right or wrong but having the ability to put words together with music has to be an inherent talent. Aww.. I hope you enjoy your last year of school thoroughly then. 🙂 As for myself, I actually preferred college to school. I think I had more friends on the same wavelength as me. But not to worry you’ll probably meet some of your school friends in college. I remember the day of the concert, I got there at about 4 something and loitered around outside until it started. Oh the agony of knowing that David was so close but yet so far! When you’re a professional songwriter I think you have to be a little concerned with writing hit songs because you need to earn your living. If a song is a hit it’s more likely to be played on the radio and on shows. And everytime your song is used your supposed to be paid for it. And also one way to get better at songwriting is to practice and experiment with the words. Hence the circles. I’m trying out Zosia’s method at the moment. See how it turns out. Btw I finished reading Midnight’s Children a few days ago. I like it but I still have a headache thinking about the message. 🙂 Oh well. I heard on the bbc yesterday there’s a water shortage in Chile? I wished a pack of feral dogs on him, not a water shortage. At least the dogs would only inconvenience him and not everone else. I’m no expert in pop songs other than David’s haha, but I did like the song you posted. I really wish D would get angry with you and accept the challenge you have set out for him haha! I’m glad you are one of those young people who places an importance to reading. Don’t let medic school stop you from continuing your very good habit. It’s so true that a formal education does stifle a student’s creativity. My daughter, when she was about 5, made drawings of the most creative and graphic quality, but her art teacher at school started to tell her that “a bunch of bananas should not be of a certain shape and colour” etc. and that began her “creativity stiflement “. I also think poetry/lyrics writing is not just a creative process. It’s also an ability and a boldness to dare to open up one’s soul to express one’s inner feelings. I went for French classes for awhile a long time ago and decided to challenge myself by writing poems. I was rather depressed at the time and the French lecturer actually “got” me – he said – your poems are beautiful but why are they so sad? So the point is: we can all create some sort of spiritual beauties by an outpouring of raw feelings if you are not embarrassed and held back.. Whether they can attain commercial success is another story haha. David, in this context, IMHO, just doesn’t open up enough in his song-writing, to reveal more rawness and soul. He needs to forget about “being good” and “passing on messages” but look inwards and make some really bold revelations about his feelings, without having to worry about what people think. His singing voice has taken a more raw and soulful quality which I love, that’s for sure, but his music-writing is too guarded and cautious. Cant help but agree with your opinion regarding David’s song-writing. We shall what the outcome will be when he’s back. Anyway, do you remember the British band McFly that David toured with in 2009? Well, one of the band member Tom Fletcher just posted this video of him singing his wedding speech. He’s got a dimple just like David, nice looking young man 😀 The video has more than 8 mil views already. Enjoy! Auntie Trace, parlez vous francais? lol I can’t speak French but I was planning to learn at the Allianz Francais in KL since I had 6 months to myself but I got a job instead. Btw I would love for D to get angry with me ❤ That'd be so hawwt 😀 Wouldn't you agree. I also remember one of the McFly members saying that, talking to David is like doing yoga. I can understand that, but I’m not sure if David’s song-writing should turn out yoga-like. Perhaps Akang could come in and give us some tips haha! which simply means I spoke a little many years ago but I lack practice. Hey you said it! Getting David to be angry with us would be so hawwt! In fact, getting him to give any sort of response other than a string of innocent smiles would be dang hawwt! And giving him a spanking would be hawwt-er still! Been wanting to do that ever since he lost AI. And the desire renewed itself when he made that announcement! Lol maybe I should nag him a little more 🙂 He might get real mad. 😉 I haven’t written to him in a while. I wonder what he’d think if he knew there were a bunch of AAM achumamas waiting to spank him haha.